I’m very happy I decided to take this Low Stress Handling Silver Certification program. I learned so much about handling animals and gained confidence in my ability to interact with animals in a positive way. It is an excellent program and I will recommend it to anyone in the animal health or welfare businesses. This program is amazing! Dr. Yin truly is a master at her craft and has such an easy way of explaining the skills so everyone can be successful. I’ve been involved in training and behavior for ten years and learn so many more techniques for explaining skills and analogies to use to help clients truly understand. At each step of the way, Dr. Yin stressed the importance of thinking about our patient and their needs. When we do, we can’t go wrong in their treatment! I learned so many new techniques that I was able to implement as I was learning in a clinical situation. I remember the first time I used a towel wrap technique on a cat in a tent in an outdoor clinic for a blood draw on the back leg and it was such a successful experience. I hope I can continue to learn and practice these techniques, as well as honor Dr. Sophia Yin’s legacy. 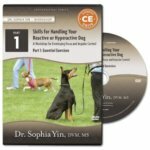 The techniques and knowledge shared by Dr. Yin in the Low Stress Handling University are essential for the health and well-being of animals in shelters and veterinary clinics. Welfare and quality of life for both animals and the people caring for them are dramatically improved through the implementation of Low Stress Handling. This course is life-changing! I would recommend this course to anyone working with animals – whether in vet clinics, training classes, grooming salons, or any other situation, but especially in those areas that can be potentially stressful experiences for animals. These methods for properly handling pets should really be the standard of care in all veterinary clinics. I learned an incredible amount from this program, and look forward to continuing my education in Low Stress Handling. I absolutely loved the Low Stress Handling University. It presented information in a clear, efficient, and concise manner and allowed me to balance my coursework whilst maintaining a fun and open learning environment. What did you like best about the Low Stress Handling University & Certification program? I loved that it was online and I could do it at my own pace. I absolutely loved being able to watch Dr. Sophia Yin train and teach, I think everything she has done is incredible and I am so glad this course is available to share her life’s work. Good layout, easy to follow, and it was broken down into straightforward segments. The video clips were appropriate, not too long or too short. The self-paces nature of the lectures and the practicalness of the examples, and also the way they present all of the information to you and allow you to make a decision for yourself. I really like the layout of the program, it was very user-friendly. The videos are probably the most valuable resource this course has to offer. I liked the videos that would explain the technique and have subtitles that summarize each technique after Dr. Yin would talk about it. The best part of the program was learning the concept behind the techniques then implementing these concepts in each demonstration. Would you recommend the Low Stress Handling Certification program to others? I would recommend this program to anyone working with any animal because all of the concepts I learned could be used in my everyday interactions with animals. I think everyone should learn these techniques to better handling and interacting with animals in stressful situations and be a part of Dr. Yin’s legacy of making out experiences as a vet better for the animal. Yes!! I think it is very important for anyone working with animals, for the patient’s sake, and the client’s experience. Definitely. I would recommend it to anyone who has an interest in caring for animals because I think we can all use some work at analyzing behavior instead of imposing our own knowledge of animals. Yes, of course, because this material is so valuable and will really help those who know and use these techniques. I would recommend this course to anyone interested in behavior or stress-free animal businesses. I think it has value to anyone who works with animals as it can be used from the smallest to the largest animal. Even if the techniques need to be modified, the ideals and principles behind Low Stress Handling are invaluable. Yes, for sure! It is very important for people to know techniques in Low Stress Handling. In reality, I feel like it should be a mandatory certification all people working with animals should be required to do! Yes! Definitely! Everyone who works in a veterinary hospital or shelter should be exposed to this training. Yes, because it covers lots of practical skills not covered in vet school. Yes, because it is beneficial and helps to reduce hard to the animals and the staff. I would absolutely recommend this program to other Veterinarians, Technicians, shelter staff, trainers, etc. Dr. Yin has pioneered a new way of thinking and it’s important that we keep her message going and at the front of new ways to interact with patients. All too often I hear about a dog bit or a cat bite that resulted from poor handling and not reading the pets cues to alter our approach. This is all preventable! In ten years of animal welfare, I’ve never been bitten and want to keep that same attention and focus on my patients and addressing their needs. Yes, I would recommend this to others who want to learn about how to do Low Stress Handling. I would absolutely and whole heartedly recommend this course.